A Royal Message has arrived in today’s post. 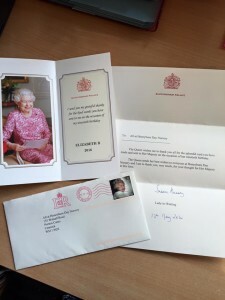 It’s from Her Majesty The Queen thanking the children for her 90th Birthday Wishes. How wonderful to receive this letter. Summer Fayre coming to a town near you! Donations of bottles, sweeties and raffle prizes would be very gratefully received. We will be sending out Newsletters shortly with the full details for the Summer Fayre, along with other upcoming events. Make a note in your diary. Come along and join us for a great day of family fun.